We’re all eagerly awaiting the Royal Wedding between Kate Middleton and Prince William. We know it will be grand, lavish, oh so romantic and most of all expensive! The truth is, every bride wants to feel like they are a princess on their wedding day, but not everyone has a royal budget to work with. Invite those that matter most. We know you love your coworkers, but when you are trying to trim the guest list, they aren’t as important as Aunt Susie. Make your wedding an intimate affair and every wedding related bill will dramatically decrease. Be flexible with your dates and times. Your first kiss was on Valentine’s Day, so we get that you want to be wed on that memorable date. The problem? A lot of people had their first kiss on Valentine’s Day! High demand dates are always more expensive. Pick a day and time that isn’t as popular and you can knock as much as half off of the price of your venue (we had our ceremony on a Friday night and paid half the cost of a Saturday night reception). Forgo the wedding party. The less attendants you have, the lower your bottom line will be. Even if your bridesmaids and groomsmen buy all of their own attire, you still have to buy them gifts. At the most, have a best man and maid of honor. Plan well in advance. 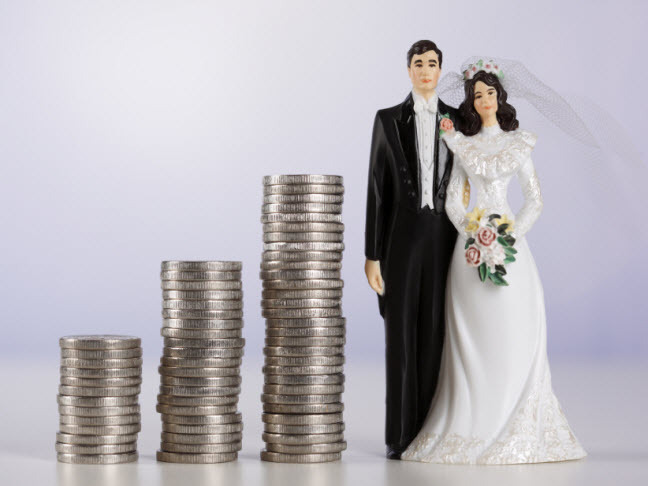 If you get engaged, plan your wedding and get married in 6 weeks, you are going to pay top dollar for everything. There’s a reason most engagements are around a year long. That takes you through a full wedding “sales cycle” and you can lock in the best prices possible. Compromise on, well, everything. If you have very specific ideas of how you want everything to be, look and feel you might not make the savviest spending decisions. Compromise and remember that the wedding is just one day. Focus on the marriage and the joy of the occasion, not the gold embossed wedding invitations. Speaking of wedding invitations, go the no frills route. Simple gets the point across just as well as fancy does. Let’s face it, we all lose those wedding invitations anyway. If you want a fancy one for your memory book, make one for yourself and send out a simpler version to friends and family. Enlist friends and family. Got a baker for a cousin? Ask for a discount on the cake. Best friend a photographer? Ask her to take some pictures. You want your friends to enjoy your wedding and not view it as “work” so be careful what you ask for. Friends and family can help with set up and tear down too, so don’t be afraid to ask. Hand me downs. Mom still has her gorgeous wedding dress she got married in? Give it a shot! Best friend still has the centerpieces from her wedding? There’s no shame in reusing and recycling. In fact, it might drop your bottom line so much that you can afford to splurge in other areas. Shop the bargain bins, clearance racks and check out Etsy, Ebay and Craigslist. Someone, somewhere is selling what you want for less. Etsy is a great spot for one of a kind handmade items that you simply can’t find elsewhere. Focus on the reason you are getting married. My wedding was incredibly romantic and beautiful, because I married the man of my dreams. We could have gotten married in a box on the street and it would have been just as perfect. The wedding is just a day. The romance and the marriage is for a lifetime. You might not have the queen in attendance and you might not have a designer gown, but you will feel like royalty on your wedding day! Did you have a royal wedding on a budget? How did you cut costs?